This website from GeoGarage layers nautical maps geo-rectified to fit Google’s brand of Mercator. The slider control allows you to adjust the transparency. First you must acknowledge that you can’t trust these maps for actual navigation! They are designed for planning and analyzing. Nice little routing tool allows you to plot a course including distances, and export to a Garmin GPS devise. Seems like huge potential here. 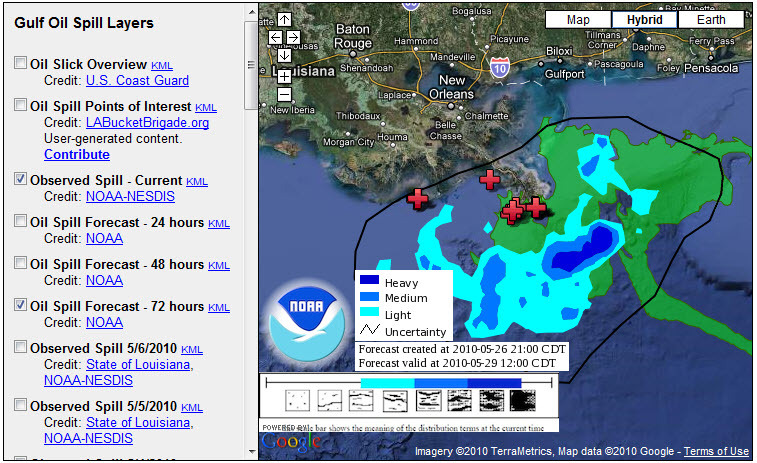 Three ways to view the spill’s progress: 1) Google Crisis center, with map data from NOAA and PBS live news feed showing the gushing oil, and 2) Paul Rademakers Google Earth representation of the (no longer works), showing how it compares in size to Manhattan, London, Paris, etc, 3) New York Times”Tracking the Oil Spill in the Gulf“,map updated daily. Update 3/9/2018: The Times site is still available. Wikipedia’s report is a good way to look back at the crisis and aftermath. 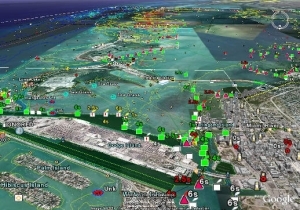 Big news on May 28th when Google released a Plug-in which makes it possible to view Google Earth, including 3-D buildings and KML files in a browser window, without downloading the full version. Very much excitement about this, and there will certainly be some great applications very quickly. 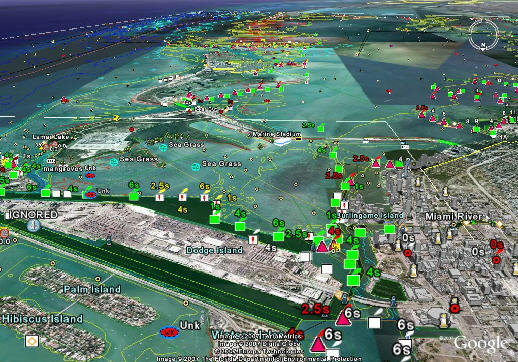 Exploring this topic, an interesting application for US boaters surfaced. 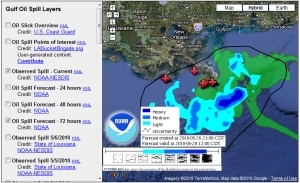 EarthNC is a low-cost application/service which allow the user to add all kinds of water charts for US coastal and inland waters to Google Earth — online or offline. It looks amazing (though I don’t have any charting know-how), and appears to have been enthusiastically received. Hope to hear back from them about whether a Dutch / European version is on the way. 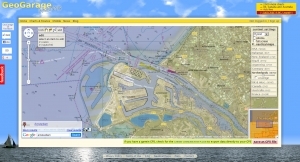 This same developer (EarthNC) has just released an online converter which allows you to create Google Earth Plug-in code with your own KML files or MyMaps URLs, which can then be embedded in your website. TakeItWithMe for Embedded Earth is in “Beta” form, but works handily (Not any more). Update 17/6/2018: EarthNC viewer will be taken offline within 6-12 months. 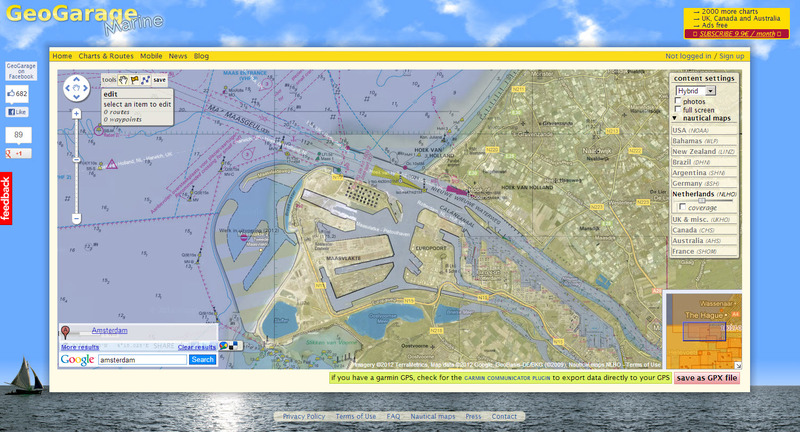 Check out free open-source website:Open Sea Map. Many more paid apps available. Water is not in short supply in the Netherlands, but management is and always has been a central concern. This Dutch website translated as “the Netherlands Lives With Water” (No longer available) 17/6/2018: uses Google Maps to show water projects, events and attractions, a nice application created by GeoStart. One event we will try to take in is a sculpture exhibition at the castle in Muiden, called “the power of water“.